By now, the entire country has heard about U.S. Congressman Joe Wilson's outburst during President Barack Obama's speech before Congress. During the speech, Rep. Wilson shouted, "You lie!" in response to President Obama's contention that the health care reform bill he's trying to get passed won't cover illegal aliens. In researching the issue, there are those on both sides of the table who argue and make excellent points regarding whether President Obama is correct or Rep. Wilson is correct. The health care bill does state that those here illegally won't be covered. But a side issue is that there wasn't anything concrete in the bill to enforce that measure and there are ways for them to indirectly benefit. Besides, even a third-grader can see that we have laws regarding immigration, and the fact that we have possibly 20 million people here illegally says a lot about Congress and laws being ignored and not enforced. But I digress. My issue today isn't to argue for either side but rather to focus on the reaction, especially within the black community, to what Rep. Wilson did. He interrupted the president during his speech, and I am amazed at the number of black folks who have been screaming on how rude it was. Especially amazing is that it comes on the heels of black people for the past eight years calling former President George W. Bush a "little shrub." Now that is not one of my terms for him, but I have to admit I could never look directly at the man. I couldn't stand to hear him speak and turned off the television anytime he came on. And I know I wasn't alone. So to now see and hear many of those who despised Bush having a hissy fit about "disrespecting the presidency" is amazing. Let's turn the tide for one second and say that it was Bush addressing Congress several years ago and speaking about going to war in Iraq and mentioning the often-forgotten "weapons of mass destruction." Imagine if a Democratic congressman had the "balls" to shout out to Bush, "You lie!" Would that person be lambasted or placed on a pedestal? I say the latter. It is also becoming quite common for many in the black community to holler "racism" any time anyone disagrees with President Obama. Knowing how much the black community disliked Bush, if the same criteria were applied to us, we would all be wearing the "racist" label. Don't forget it was Kanye West who shouted on national television after Hurricane Katrina that "George Bush don't like black people." Was West ostracized after making that comment about a sitting president? Was there outrage from the black community? The answer is no. In fact, one of the hottest selling T-shirts was an all-black one with those very words in white writing. I know. I bought one myself. To be truthful, I want a Congress that is full of people who are going to take a stand and support their beliefs and be ready for a battle. People badger me to vote for them so that they can go to Congress to fight for me, so I want them to do just that - fight! I want bills before Congress that will affect the very foundation of this country to be debated vigorously. If there are loopholes in the bill, I want them found before they become law. To make my point even more salient, imagine if our aldermen were like Rep. Wilson when it came to the parking meter deal. Maybe if one of them had been willing to shout "You lie!" at the mayor, we wouldn't be stuck in a deal that lasts 75 years and will only benefit those who put up one billion bucks to reap tens of billions of dollars in the future. Lastly, and with a change of subject, my first novel Billion Dollar Winner is available via Amazon.com. 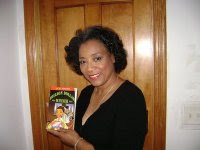 I will be participating in the Chicago Read-In on Saturday, Oct. 3, at Kennedy King College Theatre, 740 W. 63rd Street from noon until 3 p.m. I will have copies of my book available for sale and will be reading from the novel. There will be books available for all ages of readers, plus a special guest - legendary DJ Herb Kent will be on the panel with me promoting his new book. So come out and support this event and meet me, along with numerous other authors. Any company that has hired more than 3-5 illegal aliens--MUST –be entirely aware that they are hiring foreign nationals? That's why we need a comprehensive E-Verify application in operation, as permanent immigration identity software countrywide? Nor should it be on a voluntary basis for everybody. Long timers and new hires must be verified? Sen. Grassley must have heard from his constituencies, because a letter The Honorable Thad Cochran Chairman Ranking Member Committee on Appropriations Committee on Appropriation requesting their support for my amendment (S.A.1415). The amendment gives businesses a tool to ensure that they have a legal workforce by allowing them to check the status of all workers, NOT JUST NEW HIRES? The amendment allows for voluntary checks of existing employees through E-Verify in the working locations. But this amendment doesn't go far enough? It should stipulate that anybody who doesn't comply or ignores the usage of E-Verify should be held in violation of our laws. The fines should be severe, but in cases of second violations, should forfeit business assets and receive a prison sentences. These obnoxious businesses know exactly what they are doing and know the risks? E-Verify could be easily expanded for many other uses in the US, including admittance to health care, driver’s licenses, government subsidies that would include education and home mortgages? CALL YOUR DISINCLINED SENATOR OR REPRESENTATIVE AT 202-224-3121 SO THEY KNOW, HOW ANGRY WE ARE WITH THE IMMIGRATION INVASION TRAVESTY. Much more to learn at NUMBERSUSA, JUDICIAL WATCH & CAPSWEB. All American workers and legal population should be very attuned in the coming months, as the Democratic leaders have tutored President Obama in forcing into Congress another AMNESTY bill. It is an objectionable legislation to enact in legalizing the 20 to 30 (?) million illegal people who have settled around our nation? Millions more will follow over borders, by plane and any entrance ports. They are already alert that free health care lies just across the international borders, for themselves, immediate family, young and old. This is the majority parties’ method to sneak health care for illegal families by legalization; America doesn't even offer free treatment to its own people, who are hounded into bankruptcy for unpaid hospital bills. Americans absolutely cannot afford another path to citizenship, as it will have a major financial impact on our crumbling infrastructure, irreversible road to OVERPOPULATION and higher taxes. I am very agreeable with President Obama, for a European style health care package, but those illegal immigrants who have not been caught, will have to rely on a humane admittance to emergency hospitals.